Stretching the One Income Dollar: Travelling Can Be A Fantastic Experience With A Good Set of Luggage-Really! Travelling Can Be A Fantastic Experience With A Good Set of Luggage-Really! Travelling can be a fantastic experience filled with many wonderful memories. However, there is nothing like having your luggage broken on the first day of the trip, to put a damper on your spirits or broken luggage when you return home. After all, there are some things that even duck tape cannot fix. Gerry and I, travel quite often, about 3 -4 times a year, and every time, our cheaper economy luggage, has been coming home broken. A person really shouldn't have to buy luggage every time they return from a holiday! This time instead of buying yet another cheap quality luggage set we are going to be reviewing the Samsonite Maneuver Spinner Duffles. Although we aren't travelling now, we wanted to tell you about this luggage, in time for Christmas. They are constructed of a rugged ploy/nylon blend with 360 degree spinning wheels which as any traveler knows are a lifesaver as you maneuver through tight corners. The whole luggage rolls up right and doesn't add any added strain to your probably already overloaded arms. High wear areas are reinforced so that you will not get premature wear and tear. There is plenty of storage space, zippered compartments and compression straps that should make the packing experience a breeze. 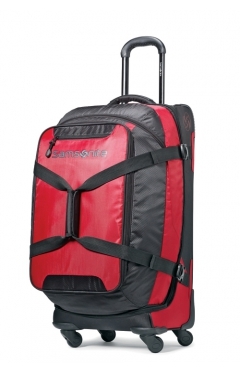 We look forward to our next trip out with our Samsonite luggage.